I’ve fallen in love. I went flying in a gyrocopter last Saturday, and now I want one! I’m fond of helicopters, but they are expensive and complicated. Fixed wing pilots call helicopters ‘a cloud of metal fatigue around an oil leak.’ Helicopters have become an expensive way for millionaire amateur pilots to kill themselves. Autogyros, or gyrocopters look a bit like helicopters. They usually have one big rotor on top, and an engine at the back with a pusher propeller. But the likeness to the helicopter is superficial. The rotor is not mechanically driven, it spins like a windmill in the airflow. Borrowing an idea from nature and spinning sycamore seeds, falling gets them spinning and the spinning slows the descent by causing a little lift to be generated. In the autogyro the rotor is tilted up at the front. The engine pushes you along and forward motion keeps the rotor spinning. If the engine should stop the impetus to go forward is reduced and the ‘gyro starts to descend, but the rotor keeps turning, it’s still being pushed around by the wind, so lift is still being generated. Engine failure on an autogyro is no big deal, the pilot still has directional control, and he can concentrate on picking out a clear spot for landing. In a ‘gyro a near vertical landing can be achieved, unlike a glider which needs to keep moving forward in order for the wing to keep producing lift. The rotor of the gyro keeps producing lift so long as it’s turning. The idea has been around since 1920 and for a while it seemed as though every home would have one. They fell out of favour when the helicopter proper came in. The pre-war gyro’s were as big as light planes, it was only after the war that technology changed. Annette wrote a blog on James Bond last week and I dug out the DVD of ‘You Only Live Twice’. That’s the one where Q provides 007 with a miniature flying machine, the gyrocopter, Little Nellie, packed up in four suitcases. The script, BTW, was by Roald Dahl, who got a mention a few blogs back for adding Gremlins to the national consciousness. 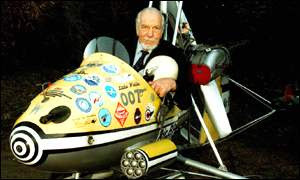 The gyrocopter in the film, was flown by its inventor, ex-RAF pilot, Ken Wallis. During the war both the Germans and British had experimented with small Gyrocopters, or rather, rotary winged kites. Both of these design were looked at after the war when gyrocopter were developed for sport aviation. The Germans had devised a compact observation platform which could be packed up and towed behind a U Boat, and the British design was intended to be towed behind a aircraft and then released. It would be used for dropping agents into enemy territory. 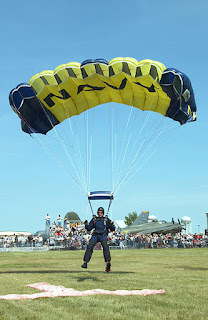 Nowadays both jobs could be tackled using parachute variations. Square, steerable chutes were developed for sport aviation in the 1960’s and adopted sometime afterwards by the military. Now Special Forces personnel train to perform high altitude, covert, free fall drops into enemy territory. 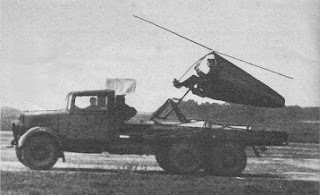 The aerodynamic ram air chutes are manoeuvrable and quite different to what was available in the 1940s. Q has fitted Little Nellie out with various devices, to make it an airborne version of the Aston Martin. On the DVD commentary track Ken Wallis, who had worked on aircraft missile firing trials, grumbles about the way a cluster of miniature missiles are fired simultaneously. He knew that in reality they must be fired in a stream for best accuracy. 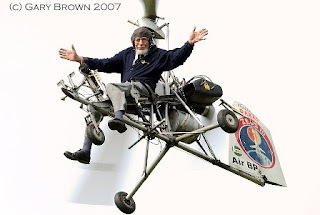 That's the movies for you, always taking liberties with the truth, but just to show that larger than life characters are not just found in films, Ken, born in 1916, was still flying his autogyro at the age of 90! Oooo! I want one! Wouldn't it be fun to fly a gyrocopter? Very cool. Thanks for the explanation on how they work. What I had in my head was something entirely different. This makes much more sense. 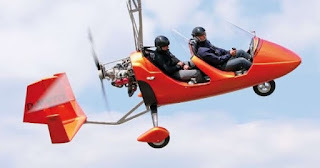 This was a gyrocopter that was developed in the uk. It was intended as a short-hop airliner for city-to-city travel. The engineering was amazing, it took off as a helicopter, with the rotors propelled by tiny jet-engines at their tips (these powered from the main engines in some way that I now forget). When it was in the air, the two main propeller engines took over, the tip-jets shut down, and it became a gyrocopter, meaning it could fly faster than a helicopter (the same idea as used in 'airwolf', but the rotodyne existed). If the tip-jets failed when you were landing, no problem, fly to an airstrip and land it like a normal aircraft. If either engine failed, no problem, if both engines failed it was still possible to safely land as a pure gyro, provided you got down quickly (the gyro-copter effect allowed you to soft-land like a sycamore leaf). This amazing piece of technology would have revolutionized short-hop transport, except that the government chose to forcibly amalgamate all the helicopter companies into 'Westland' (remember that? What happened to that, I wonder?) and the project got 'lost' in the shake-up. Eventually, even the working prototypes were lost, and the rotodyne is now just a few pictures on wikipedia. Another great British technical achievement snafued by like of vision, and government meddling. This make a non-torque rotor system which means that an opposing tail rotor is uneccessary. This IS a good thing, but I imagine engineering the air and fuel feed up the main shaft and out along the rotors might have had some intersting safety implications. The tip-jet concept, or rather a tip-rocket, is an idea that's been hijacked recently for a backpack sized Hydrogen Peroxide powered helicopter. H2O2 flows down the rotors to pass through a catalist where it flashes off into steam to produce thrust to push the rotor around. It sounds like it ought to work.